Okay, so have you ever tried making dinner with a toddler? A toddler that is clinging on your leg? Or a toddler that is fishing out day old banana peels from the trash can? Or a toddler that opens the freezer drawer of your refrigerator and then stands in front of it, enjoying the blasting cold air? Well, if you haven’t, welcome to my world. It’s an art to cook with your toddler in the kitchen. And if you have a toddler then you know exactly what I’m talking about. Yesterday was one of those days when said toddler just did not want me to cook. But I had to. There’s only so much take out you can live on. I know, I know, take out food rocks. But I’m trying to eat healthier these days so had to make something quick and easy. Without going nuts in the kitchen. And this easy 30 minute Chickpea Curry is just the answer for a situation like this. This is one of the easiest recipes I’ve ever made, but it does not compromise on flavour at all. There are minimal ingredients involved, little time spent on chopping onions that make you cry (thank you onions, for making this even more difficult for me) and a big va va voom flavour to this chickpea curry. So let’s get down to the ingredients that go into this dish. We start with freshly chopped onions that are lightly sauteed until just softened and translucent. Then we add in freshly crushed garlic and ginger and take in the lovely fragrance of the garlic and ginger hitting the oil and releasing their flavours. Then go in two cans of chickpeas and the spices and tomato paste. We saute for a few minutes, ask the toddler to close the door to the freezer, and watch in exasperation as they move onto to dumping the cereal box on the floor and then go on towards the garbage can to foray for trashy treasure. Then we add in two cans worth of water into the pot, put the stove on medium heat and let the flavours marry and simmer for 15-20 minutes. This time can be spent cleaning the kitchen after the mayhem caused by said toddler. Or you know, just leave the kitchen and pretend you don’t know there’s a mess in it. Come back to the kitchen after 20 minutes or so. Take off the lid of the pot, and watch this beautiful orangey curry simmer away and dream of having it for lunch in peace when the said toddler is down for a nap. Serve with white rice or flatbread. This delicious chickpea is easy, quick and very healthy. 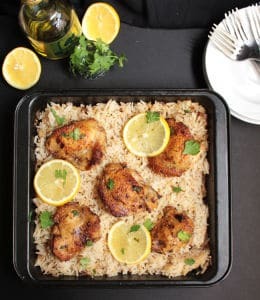 Ready in just 30 minutes, it's delicious served with rice and flatbread. In a large heavy based pot, heat the olive oil and add the chopped onion. Fry the onion for a few minutes until just slightly softened and translucent. Then add in the chopped garlic and ginger, and fry for 1-2 minutes until just slightly cooked. Add the drained chickpeas, the spices (salt, red chilli powder, ground coriander and ground cumin). Also add in the tomato paste. Cook on medium high heat for a few minutes and then add in the water. I used the same chickpea can to measure the water and added two cans of water. You can reduce the amount if you like a less soupy curry. Bring to a simmer and then cover and cook on medium low heat for 15-20 minutes. 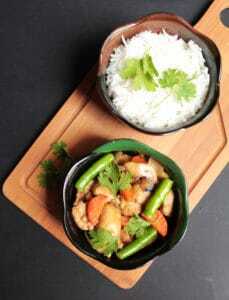 After 15-20 minutes take off heat and garnish with fresh coriander. I love these photos! I am sad I can’t try this right now – it sounds so healthy and loaded with flavor. Ive never thought of using chickpeas in a curry. That is a great option since Im trying to cut down on the number of meals we have with meats. I also wanted to complement you on your photography— it all looks so mouth wateringliy delicious! Beautiful! I love anything with chickpeas in it, this looks amazing! Been there, done that with both of my children tugging on my leg- I deserve a vacation! This looks delicious! I love curry and chickpeas & together-yum! This looks like such a hearty and warming dish. I love chickpeas, and especially cumin! 30 minutes? I’m sold! I’m always in need of some quick sides for dinner and this one looks amazing! I love that I can have it done in about the same time as our dinners usually. I’m always looking for good curries and yours looks INCREDIBLY good!! Can’t wait to try it! I love curries, and the addition of chickpeas is such a great alternative to meat! So easy and so good… And yes, moms need real food to eat in peace themselves! This sounds like just the right quick meal for any of us who can’t always put much time or attention into cooking. 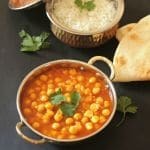 We love curry here but have never thought to add chickpeas to it. What a great idea. Looks delicious too! 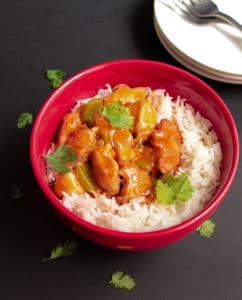 My girls are just past the toddler stage and are now on to the wanting to help with everything in the kitchen, which presents a new set of challenges, but is also a lot of fun 🙂 I love chickpeas and curry, so this is right up my alley it sounds delicious and my girls will enjoy making it with me too! Strangely enough, I DO have a toddler running around my kitchen while I cook now a days. I got a chuckle out of your story. I relate! This dish looks perfect for busy day cooking. And I love whats in it!